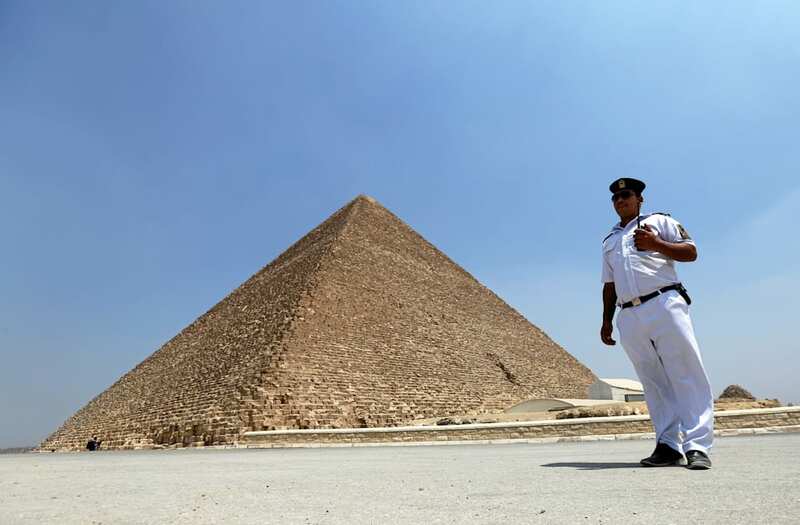 The tallest and oldest of the three large pyramids on the Giza Plateau has a mystery sealed inside. More than 4,500 years after it was constructed to house the remains of Pharoah Khufu, a team of more than three dozen researchers announced Thursday that they’ve discovered a huge, secret space hidden behind its walls, according to a report in Nature. The massive void is located above what’s called the Grand Gallery — a passage with 28-foot ceilings that leads to Khufu’s tomb — and measures at least 100 feet in length. While Khufu’s pyramid, often times called the Great Pyramid, is one of the seven wonders of the world, it’s mostly remained shrouded in mystery. There’s no other structure quite like it and it’s status as a national heirloom makes it difficult to probe. THE GREAT PYRAMIDS OF GIZA - JANUARY 3, 2017: DigitalGlobe satellite imagery of the Giza Pyramid Complex on the outskirts of Cairo, Egypt. Photo DigitalGlobe via Getty Images. Cairo, Egypt the Great Sphinx of Giza standing tall with the Great Pyramids of Giza in the background. This particular one is The Pyramid of Khafre, the second largest of the three great pyramids. Pyramid of Khafre and old monuments at Giza plateau. A team of experts at ScanPyramids, however, realized the technology used to examine the insides of a volcano — called muography — could be used to look within the pyramids. The technology relies on high-energy cosmic rays, which shoot subatomic particles called muons toward the ground. Muons are slowed by large masses, like the rocks used to make up the pyramids. By placing muon detectors in strategic areas, researchers are able to track the particles moving through space. They rely on them to create a sort of picture, which reveals whether an object is made up of a dense material or is a completely empty space. “This void was hiddien in the construction of the pyramid. It is not accessible and we needed this new technique, at the right time, to identify and to discover it,” Mehdi Tayoubi, a co-founder of the HIP Institute and a researcher with ScanPyrmids, told reporters. Still, no one yet knows what the passage is exactly.